A story. In 2010 I participated in a conference on Moroccan Jews in beautiful Essaouira on the Atlantic shore of Morocco. Part of the program was a screening and discussion of Kathy Wazana’s film, “They Were Promised the Sea,” about critical non-Zionist Moroccan Jews (such as Andre Azoulay, Simon Levy, Shira Ohayon, and myself). In the audience were many international scholars of Moroccan Jewry. The Israeli group was the largest and included mostly scholars of rabbinical literature and liturgics, most of whom were religious Zionist Israelis of Moroccan descent. As the film ended some of them gathered around me and the filmmaker, verbally abusing her. She could not take it and canceled the panel discussion. What was most upsetting for them was not the critical views expressed—they have heard worse in Israel—but the fact that they were expressed “in front of the Muslims.” “Shame on you,” one professor shouted at me in Hebrew, “you should be grateful to the Zionist movement that salvaged you from these Muslims and gave you a homeland.” Another educator and writer asked me: “Where were you today, had you remained in Morocco with the Muslims?” Our Muslim colleagues and friends started gathering around us. Because it was in Hebrew, they could not understand the passionate argument. I turned to the Israeli scholars and said, “Before I answer, let me please translate your remarks to our Muslim friends.” They gave me their best begging looks and said, “No you won’t, don’t you dare! It’s not fair!” I did, word by word. Everything fell apart. Both groups left the arena. 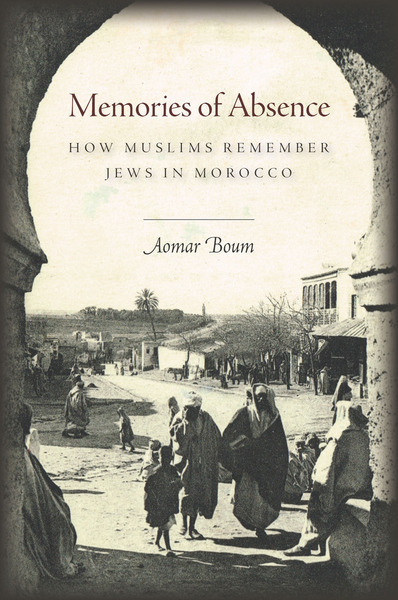 This memory resurfaced while I was reading Memories of Absence, Aomar Boum’s groundbreaking new book about how four successive generations of Moroccans remember the country’s Jewish community, which has a population less than four thousand today, compared to hundreds of thousands a few decades ago. Boum is an assistant professor of anthropology at the University of California, Los Angeles, and the coauthor of Historical Dictionary of Morocco (Lanham, MD: Scarecrow Press, 2006), an academic overview of the history and politics of Morocco. He is also a native of the M’Hamid oasis in southern Morocco. The book navigates truthfully and openly between the deception of nostalgia and the duty to confront reality, with complicated issues of identity, anti-Semitism, and memory at play. A great example of this comes as two of Boum’s subjects discuss the Shaykh Omar Museum for Saharan Jews in Akka, southern Morocco, his principal region of study. Abdelhaq, a Muslim elder, said “It is a shame that the same Jewish individuals we are celebrating in this museum have stolen the property of our Palestinian brothers” (p. 109). On the other side stands Ibrahim Nouhi, the founder of the museum: “The Jews of Akka lives in Israel. I do not agree with how Israel is treating Palestinians on a daily basis. But I will never refuse the Jews of Akka their place in the museum, because once upon a time their home was here . . .” (p. 110). I sympathize with Ibrahim’s feelings towards the injustice done to the Palestinians. But at the same time, I am not judging Moroccan Israelis—and this is the main reason I celebrate this book’s publication—because they have been forced to choose one nationality, and they chose the European-Zionist one. They still choose this option every day. I do not judge them, but I do demand of them to be open about their choice. Some of them, like my parents, still say, “we can choose Zionism and still love Morocco, because the Moroccan Muslims are not like the Palestinians . . .” Of course, what they meant is that, “Moroccans never hurt us, unlike the Palestinians,” ignoring the role they play in the oppression and humiliation of the Palestinians. It is not as simple as it is beautifully portrayed in the book: the business of remembering is toying with us as time goes by. And more than that, as Boum shows, remembering is largely controlled by governments and their agencies, like in independent Morocco, as well as in Israeli textbooks. Courageous anthropological studies like Boum’s act as freedom fighters of memory, liberating these precious stories before they disappear with their carriers. Hajj Muhammad, an over-ninety-year-old “village historian,” was one of several individuals to offer Boum such precious and illustrative stories. He provided detailed, valuable information, like how Muslims protected their Jewish neighbors in a particular village, and, more importantly, how other villages respected that relationship (p. 60). Hajj Muhammad also recalled the role of the Jews as transporters (on mules and donkeys) of news and goods from village to village (p. 60). I was born in Morocco. My family is from the Tafilalet region northeast of Akka, by the Algerian border. As a young immigrant in Israel, my father’s longing for his community was vivid and present in our daily life; his rejection by his so-called “Jewish brothers” from Europe had sent him right back to his Moroccan memories. He felt, as he described to me many times, the burden and duty to salvage the memories of the elders of our tribe. The feeling led him to write a book, The Terror of the Dream, about his home village Gourrama and the surrounding region. When reading Boum’s book, I was reminded of my father’s stories—I wished my father could read English. (When is the French coming out?) For that reason I loved the detailed storytelling of this book. At times I felt like I was reading a novel; it seemed the only way to tell this story, counter to historical/archival accounts, which never serve biological memory, but rather disturb it. You will not find in Israeli textbooks the type of sad memory told by Ali, Boum’s ninety-year-old guide, about the Jews of the Sous valley: “Look around you: the only thing left of the Jews today is their deserted and decaying buildings. Their shops are closed. Their houses are mostly unoccupied. The only reminder of their presence is their cemeteries. Their tombs remind us of a Jewish time and place. It is as if Tagadirt is a factory that closed, leaving thousands unemployed and without salaries. I wish the Jews had never left. They added yeast to this economy” (p. 14). There are so many accounts like this portrayed in the book, on different eras of Jewish life in Morocco. These include the era of the Moroccan struggle for independence, a struggle sometimes painted in religious colors to better recruit the people, and the years of the 1947–49 war in Palestine. In both cases, Boum relays memories that show a national gap opening in Morocco. Moroccan Jews remember and the Muslims in this book remember. Their accounts of stereotypes and growing hatred toward Jews and Christians are all attributed to the ever-fueling Israel-Palestinian conflict—or to be more exact, the occupation of Palestinian land and the oppression of its people. As Boum depicts in his book, very few Muslims in Morocco are dedicated today to interfaith dialogue—trying through museums, festivals and publications, to step into the void of knowledge about the Jews of Morocco—and that gives way to ignorance. In Boum’s short epilogue, he lays bare the motivation behind his study: “The task of responding to stereotypes about Jews is left to a few individuals while the state takes the back seat” (p. 161). When reading this moving epilogue, I could not escape one tragic, symbolic fact: the memory and history of the Jews of Morocco are being erased by the Israeli schools and textbooks. While in Morocco we see a paradox, as the book concludes: the government and the palace have been known for good policies towards Jews for generations. (For example, every Moroccan Jew is welcome to come back and renew citizenship. I did.) But at the same time, new generations learn very little in schools about the Jews of Morocco, and thus they are left exposed to stereotypes and racist ideas. It is hard for me to say who the victims of such memory erasure are. I only know that ignorance of Moroccan (and other Arab) Jewish history in Israel is a substantial tool in the Zionist task to de-Arabize Palestine from the sea to the river. Therefore, many Israeli Moroccans have only one perception of the Arab and the Muslim: the enemy. Yet, like Boum, I am hopeful, because there is a cultural awakening in Israel of the second and third generation of Moroccan Jews (and other North African and Middle Eastern Jews). They can be heard singing in Moroccan Arabic, and they listen to Andalusian music and research their past and roots. In Morocco the situation is more difficult because there is seemingly no interest, in times of political turmoil, in remembering the Jews. But I see hope in the same places and efforts Boum talks about, and they all concentrate on culture. On that basis I join Boum in his call for the Moroccan government to step into the void left in schools and textbooks. Remembering the past is the only way we can imagine the future. This book is a great model for that. I hope it will make its way into hearts and curricula of pedagogues and educators in Morocco, some whom I know are making an effort. A story to end. My late uncle Shamun Chetrit was a respected man in Morocco with many shops and property. He also served as the Shaykh of the Jews in our town. During the 1950s, he refused to move to Israel; however, in 1963 he was swept along with the flow of Jews and he soon found himself selling vegetables in the local market in the city of Ashdod, struggling to provide for his children. Not long before he passed away, I had a short conversation with him in Moroccan Arabic (he never spoke Hebrew to me). I asked him why would not go visit Morocco like many other Jews were doing. He waved his hand at me and his voice grew angry: “If I go back to visit, I’ll wear my jalaba and belgha and I’ll never come back to Israel.” I was not surprised by his answer, but had to ask, “How come, uncle?” He replied in a quieter tone: “How do you think I’ll have the face to leave Morocco again?” In other words, he regretted leaving Morocco, and knew he would not make the mistake of leaving a second time. So for the sake of his family he chose not to visit at all. Uncle Shamun never went back. I felt his absence strongly in every page of this important book. He would be glad to know he is remembered as a Jew, but no less as a proud Moroccan. Sami Shalom Chetrit is a Hebrew poet, scholar and filmmaker, and author of Intra-Jewish Conflict in Israel: White Jews, Black Jews (London: Routledge, 2009). His latest documentary film, “Shattered Rhymes—the life and poetry of Erez Bitton” (a Moroccan Israeli poet), is available now. He is an associate professor for Hebrew and Middle Eastern studies at Queens College, The City University of New York, and his upcoming book of poetry in English translation, Jews, will be published in November 2014 by Červena Barvá Press, Boston.